Gaza City: It is raining dust and shrapnel, and the night is alive with the sound of screaming. In the darkness, as the world explodes into pieces and concertinas into the ground, the first battle is to breathe through the fear and choking air. Buried beneath the sea of grey rubble, dozens of Gazan families have met their death; mothers, daughters, fathers, sons, babies and grandparents. This carnage has played no favourites. Initial estimates indicate up to 80 per cent of the victims have been civilians in a war Israel says was aimed only at militants. Fairfax Media has interviewed eight families who lost multiple members in single Israeli attacks over the past month, mostly in airstrikes in the dead of night. The numbers are almost incomprehensible – the Abu Jame family lost 26 people, including 19 children and five women, in one air strike; the Najjar family lost 20 people, including 12 children and six women. Preliminary analysis of figures collected by the Israeli human rights group B’Tselem, based in Jerusalem, as well as the Palestinian Centre for Human Rights and al-Mezan Centre for Human Rights, both based in Gaza, indicates at least 54 families lost four or more members in Israeli attacks. The list is not complete. Bodies are still being pulled from the rubble as the ninth ceasefire negotiated since the war began on July 8 continues. While initial assessments indicate the majority of victims were civilians, there is no doubt some of those killed were affiliated with militant groups fighting in Gaza. According to the United Nations Office for the Co-ordination of Humanitarian Affairs, at least 1965 Palestinians have been killed since Israel’s Operation Protective Edge began. ”Of the initially verified cases, 1417 are believed to be civilians, including 458 children and 238 women, and 226 members of armed groups. There are 322 persons who could not be yet identified or their status established,” UNOCHA says. According to the Palestinian Ministry of Health, 9986 Palestinians, including 3009 children and 359 elderly, have been injured. Despite the high number of child and civilian casualties and the dozens of families who lost multiple members in the attacks, the Israel Defence Forces denies it targeted civilians. ”As an absolute rule the IDF never targets civilians under any circumstance,” an IDF spokesman wrote in response to a list of questions sent by Fairfax Media. The IDF went out of its way to warn families that their house was about to be hit in an air strike on ”legitimate and dangerous terror targets”, the spokesman said. He described Hamas as a terrorist organisation that ”exploits its civilians as human shields and callously embeds its terror infrastructure within the urban environment, including in schools, homes, hospitals and mosques”. 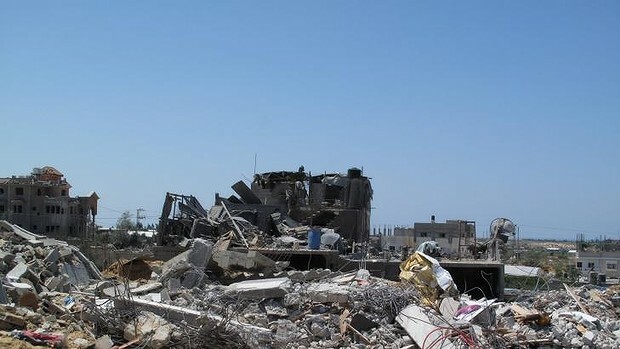 However, B’Tselem says the scope of Israel’s airstrikes in Gaza indicate they were authorised by senior military and political officials, and granted advance sanction by the Military Advocate General Corps and the Ministry of Justice. ”That is not something that would have taken place unless it was pre-authorised by a senior official,” says Hagai El-Ad, director of B’Tselem. 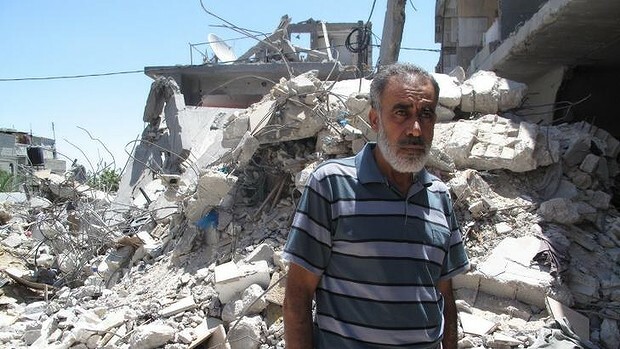 The policy of bombing these homes may not be legal, Mr El-Ad says, because the mere fact that someone from Hamas or Islamic Jihad lives in a home does not make it a legitimate military target. In the cases where a house might be a legitimate military target, it comes down to a question of proportionality, he says. 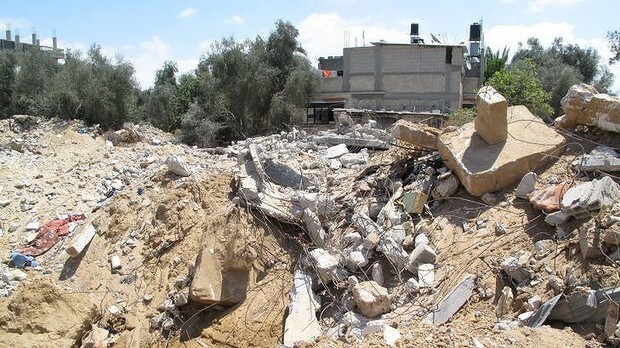 The Military Advocate General – the highest legal office of the IDF – has both the authority to approve these ”aerial home demolitions” and is the body responsible for investigating whether they were legal, he says. The deputy director of the Gaza-based Palestinian Centre for Human Rights, Hamdi Shaqqura, says the month-long onslaught on Gaza was not a war against militants but a targeted attack on families. 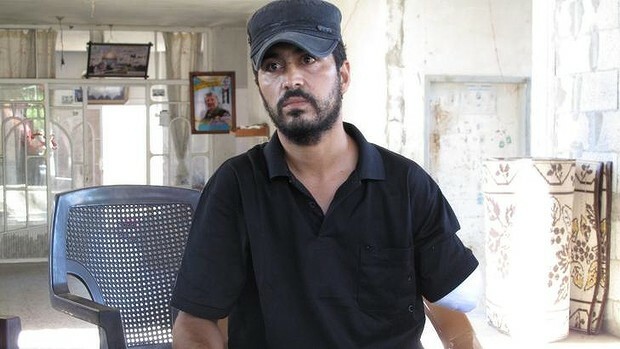 ”We have dozens of families smashed under the rubble of their houses,” he says. ”There has been complete disregard for civilian life in general and a complete disregard for the principles of international law, which requires Israeli forces to distinguish between military and non-military targets, and combatants and non-combatants. There were many examples where the IDF had used disproportionate force against civilians, dropping missiles weighing more than 2000 pounds on apartment blocks and indiscriminate artillery shelling in heavily populated areas such as Shujaiyea and Khuza’a, Shaqqura says. ”It was a deliberate attack on the fabric of Palestinian life – our families,” he says. The drones above the tightly packed Khan Younis Refugee Camp were persistently noisy in the early hours of July 10, as families chatted together on another long Ramadan evening. 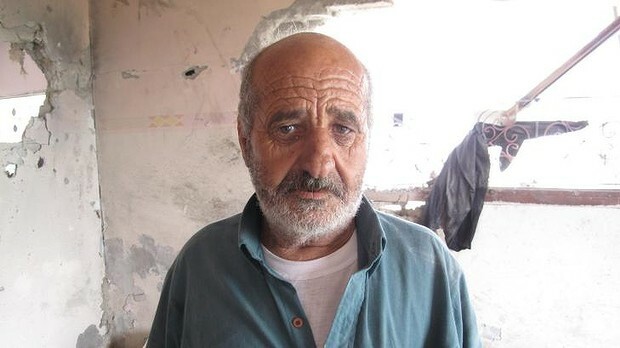 Mahmoud, 55, and his wife Basmah, 52, were sitting with six of their eight children when, without warning, two missiles fired from an F-16 hit their modest apartment block. At the sound of the explosions, Mohamed al-Hajj, Basmah’s brother, who lives next door, ran outside to see what had been hit. ”I followed the sound and the dust and I found my sister’s place blown apart,” he says, standing in the jumble of concrete, wire, clothes and school books that now mark a scene of such sorrow. Mahmoud and Basmah’s son, 25-year-old Yasser, was at his friend’s house nearby when the missiles hit. His parents, along with six brothers and sisters, died in the attack. ”They were all excellent people – I do not know why this has happened to them. My parents were only focused on making sure we did well at school and at university,” he says, sobbing. Ten-year-old Ismail was playing soccer on the beach when he was torn down by a shell fired from an Israeli gunship stationed in the Mediterranean just off the beach in Gaza City. The desperate attempts of Ismail and his three young cousins, Mohamed, 11, Zakaria, 10, and Ehad, 9, to run from the attack were captured in footage that shocked the world. ”He was growing up one centimetre by one centimetre and suddenly in one second, a missile hit him and he was cut to pieces,” Ismail’s father, Mohamed al-Bakr, 52, says. 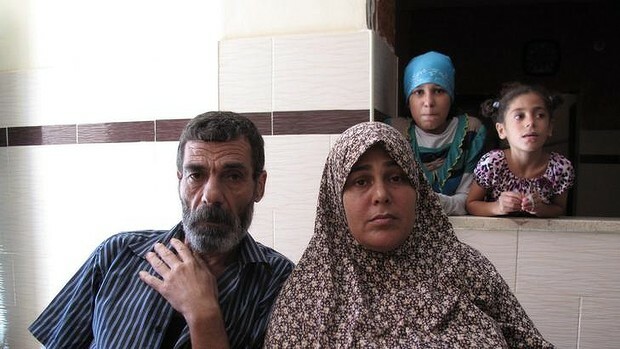 The family – like so many visited by Fairfax Media in Gaza – are in agony over their loss, angry, weeping, bewildered. One boy, 12-year-old Saeed, who survived the attack on the beach that killed his brother Mohamed, sits at his mother’s feet, his arms wrapped around his knees, his head resting on his hands. His small body is filled with shrapnel from the attacks, but Gaza’s hospitals are too overstretched to deal with his pain right now – when it is quieter they will schedule the surgery needed to remove the deadly shards of metal. Alian Abu Jarad pulled the body of his eight-month-old nephew Musa from the rubble of his family’s lounge room as other relatives dug through the debris with their hands in a desperate search for survivors. It was just after iftar – the meal to break the fast during the holy month of Ramadan – and families in each house were settling in for the evening. 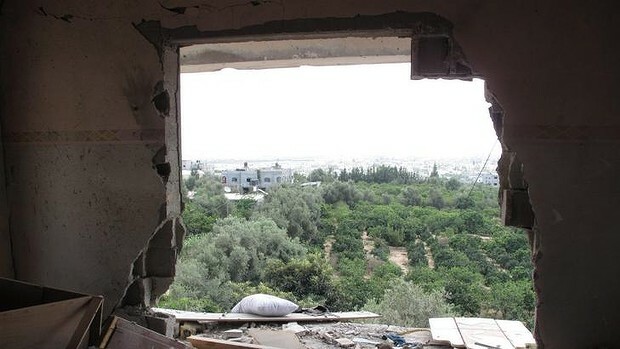 Without warning, a barrage of shells hit, Alian says, first his nephew Abdulrahman’s place and then his own next door. Eight died and 12 were injured in the attack. ”I saw bodies cut to pieces, people without their arms, without their legs – the shrapnel was so big,” he says, picking up a piece of metal from the floor to show me. 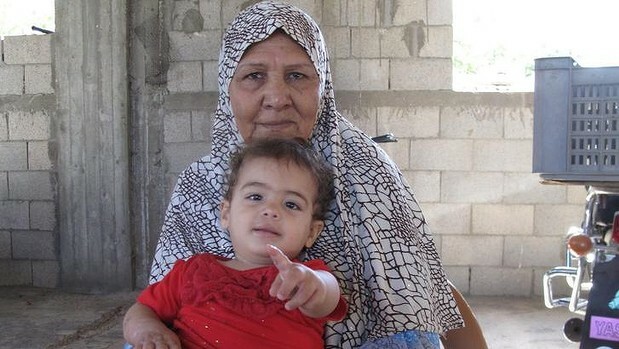 Despite Israel’s insistence that it alerted families prior to attacks on their homes, Alian, 62, says there were no warning leaflets, no phone calls and no text messages. ”You don’t know if at the end of this war you will be a victim or a survivor,” says Dr Hasan Ziyada, a trauma psychologist who is dealing with his own terrible loss. His mother, three brothers, a nephew and his sister-in-law were killed when an airstrike demolished their home in al-Bureij in central Gaza. Along with his own four children, he is caring for five grief-stricken nephews. He sees signs of trauma in himself and also in his children, who are terrified every time he leaves the house that he will not return alive. Any child who is nine years old or above will have active memories of the three recent Gaza wars – Cast Lead in 2008-09, Pillar of Defence in 2012 and this conflict, which is not yet over. They are the traumatised generation and this war, which has attacked the two main pillars of Palestinian society – the extended family and religion – is ”more intensive, more brutal” than the ones before it, he says. ”Children are severely frightened during the shelling, drones, airstrikes, and the scenes on the television of the chaos … some wet the bed, they are easily provoked, their tolerance is very low and they are easily distracted. Ultimately, he says, the reality for Gazans is this: there is nowhere safe to take shelter. The leaflets dropped from the sky warned families in their neighbourhood to leave – that the Israel Defence Forces were about to expand their ground invasion – so Shadia al-Qassas, 34, and her husband Saad al-Qassas, 36, gathered their children together. ”We have no car, so we walked all together to my father’s place once the shelling started,” Shadia says. One day later, as her two eldest daughers, Lamyaa, 13, and Nasmah, 12, were on the fourth floor making pizza with their cousins, a missile hit the fourth-storey apartment and in an instant, they, along with eight relatives, were dead. ”I took the rest of my kids and ran down the stairs to get out of the building as we were expecting more rockets,” Shadia says. ”I thought whoever is still alive would be downstairs by now, and I knew my two daughters must be dead.” Lamyaa had wanted to be a teacher when she grew up, Nasmah a hairdresser. Her husband continues the story as their surviving children mill around his wife, severely traumatised and desperate to stay close. ”They were cut into pieces. We could not recognise their faces, only their clothes,” Saad says. There is a gaping hole in the ground where the Abu Jame family home once was. Smashed concrete, a shoe without a pair and a pool of muddy water is all that’s left of the three-storey apartment block that was home to three brothers and their extended families. I am standing with Basem Abu Jame, 31, on crutches with fresh plaster on his badly broken leg as he contemplates, in silence, the magnitude of his loss. One of only three survivors of the airstrike that killed 25 family members and one young adopted boy, his fierce grief is reverberating from every fibre of his being. Suddenly an F-16 roars through the sky and a missile screeches past. We scatter, Basem hopping on crutches and the rest of us running for the nearest house as the missile slams into the ground near by. A neighbour brings its remains – searingly hot chunks of metal – on a piece of cardboard for us to inspect, and Basem, who owns a small fruit and vegetable shop, tries to describe what life is like without Yasmin, his 24-year-old wife, and his three daughters, Batul, 4, Suelia, 3, and Besan, 18 months. ”We will not ever recover, it is like a wound, it will heal but it will leave a scar. Tears brimming in his eyes, Mahrous, 67, takes a carefully folded, handwritten note from his pocket and begins to read. Listed are the names, ages and ID numbers of his family members – dead and alive. 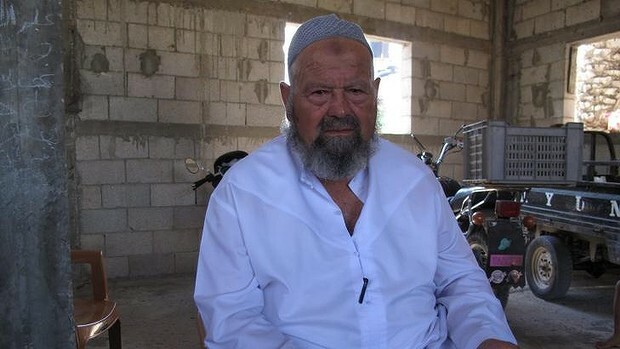 After the Israeli drone strike that killed 11 of his family on July 21, that piece of paper is the only place – apart from his memory – that his family will ever be intact. His wife Dalal, also 67, sits down with 16-month-old Myar, who lost both her parents and her brother in the drone strike and is in a full-body cast to try to stabilise her broken pelvis, leg and hand. Their son Nabil, 33, joins us. He has just been released from hospital after a second round of surgery on his left arm, which has been amputated above the elbow. He earned an income farming, but the challenge of doing that with only one arm pales into insignificance as he speaks about the loss of his wife and four children in the attack. A fifth child is dangerously ill in a hospital in Egypt. Nabil still sees the attack as vividly as if it were happening right now. It was 6am and there were three airstrikes close to the house. Shrapnel was flying everywhere and the family decided it was time to evacuate. He ran to the left to warn his neighbours, his family ran to the right. Two missiles fired from a drone hit in between them, killing 11 and injuring nine. ”The air was full of dust, I could not see,” Nabil says. ”My son was just a few metres from me, I could feel his body next to me. Despite Israel’s promises, there was no warning before the attack, he says. 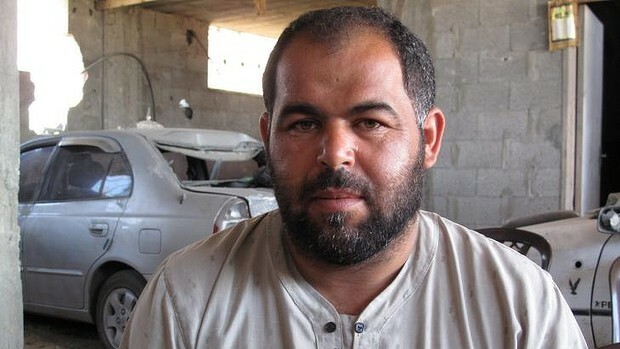 It was 3.30am when the airstrike hit, says Salah al-Najjar, 34. ”It was totally black, I had a torch and I could hear my nephew calling me for help, but I couldn’t see him because of all the dust and the darkness. Nafjas al-Najjar, 45, was one of those rescued from the rubble. She is lying on a bed in a small room in her brother’s house, covered in a blue checked sheet. Her pelvis is broken, her left eye black. ”We were sitting at a low table in the living room, having food and watching the news on television,” she remembers. ”Suddenly there was huge thunder, the electricity went out and it was completely dark. Bricks were flying, they were covering my body. A large bag of painkilling medication sits on the end of her bed, while her 10-year-old daughter Naama, who was also rescued from their shattered home, sits on the floor beside her. She has barely left her mother’s side since the attack that killed her father and her siblings. ”What is our guilt? What is the guilt of my husband and children?” Nafjas asks.